Have you ever looked longingly at modern furniture that uses polished concrete, but though it was never an option because it’s just too heavy? No longer! There are many exciting, cool furniture designs that use new materials to get the look of cement without the excessive weight. A new travertine stone called Pavenza looks like cement, but actually weighs less than solid wood. 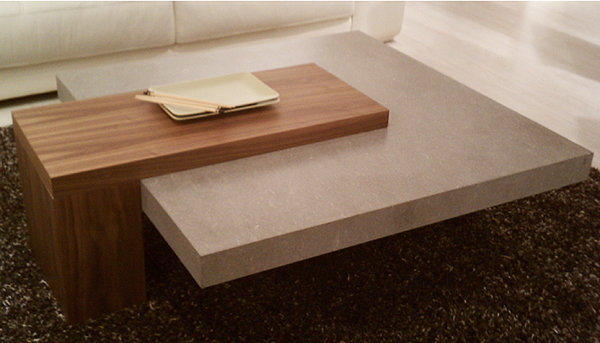 This large coffee table weighs just 238 pounds, where a real cement table of the same size would weigh in at 500+. 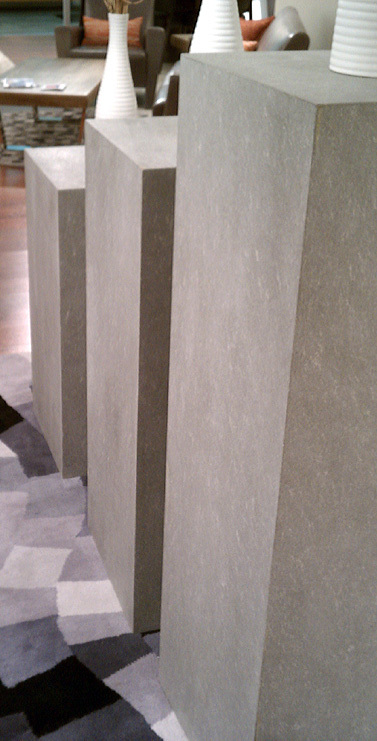 We also love these cement-look pedestals for displaying art or adding visual height to a room. Even though they measure 30, 40, and 48 inches tall they are still fairly lightweight and easy to reposition or clean. 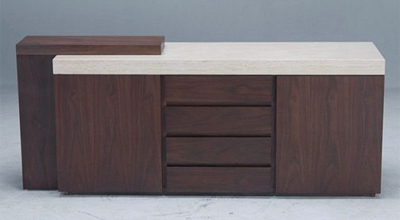 This buffet also uses the travertine stone to get the modern look of cement for the counter, but still weighs less than 300 pounds. That’s the same weight as a normal buffet or dresser in solid wood. Cement alternatives also resist staining and clean easily, so they’re a great choice for counter surfaces on dressers or buffets that can get heavy wear and tear. So next time you’re shopping for contemporary furniture, don’t discount pieces just because they look like they’re made of concrete. You can enjoy modern line furniture and still be able to move it around your home by taking advantage of these new cement look-alike materials. I just bought this coffee table at a thrift store and I love it! Do you know the brand name? I’d love to look for more pieces. I worked with this vendor directly 4 years ago, and now they are out of business. They were called Furniture Resources at the time.